Six former South Gloucestershire councillors have been made Honorary Aldermen at a special ceremony which took place before full Council on Wednesday 9 December. 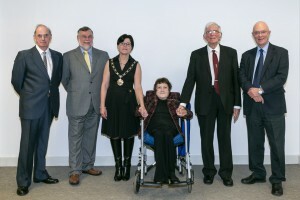 John Calway, Sheila Cook, John Godwin, Alan Lawrance, Mike Robbins and Terry Walker were each given the title of Honorary Alderman in recognition of their eminent service as past members of the council. Cllr Erica Williams, Chair of South Gloucestershire Council, presented the awards. She said: “The title of Honorary Alderman is bestowed to individuals who have contributed a great deal to their local council. The Honorary Aldermen who attended the meeting were presented with a framed certificate by the Chairman Cllr Erica Williams.